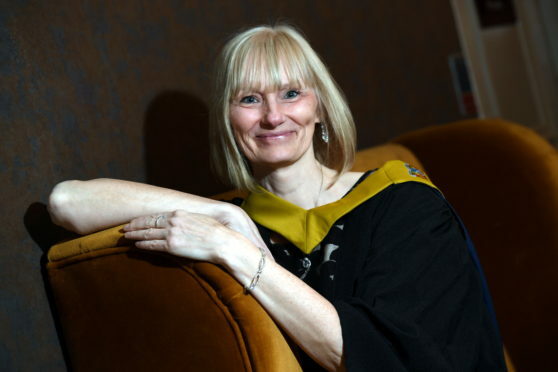 Dawn McLeod graduated with a HND in Administration and IT from Nescol. One student realising a life-long ambition yesterday was 54-year-old Dawn McLeod from Aberdeen. She always regretting not sitting any formal exams at school and she said it had been her “dream” to achieve a formal qualification. Initially, she thought she had left it too late to attend college, but yesterday, as she picked up her HND in Administration and Information, Mrs McLeod said she was “so happy” she had. On leaving school, she worked in retail until starting her family and thereafter moved into an administration job. A change of direction then led to a ten-year career in social work, firstly in criminal justice and then as a family support worker. Yesterday she said the move back to administration was through encouragement from her sister, adding: “She persuaded me to look into studying. “I was still drawn towards a career in administration but realised I didn’t have the qualifications to apply for the jobs I was interested in. “I would advise anyone at any age to consider a course of study. “My age was not an issue. In fact the diversity of ages was a real asset during class discussions. “We helped each other out and I think everyone learnt from each other.